Clay is a mineral which can be shaped and formed in different ways. When fired, it turns into ceramics – the stuff of bricks and teapots. 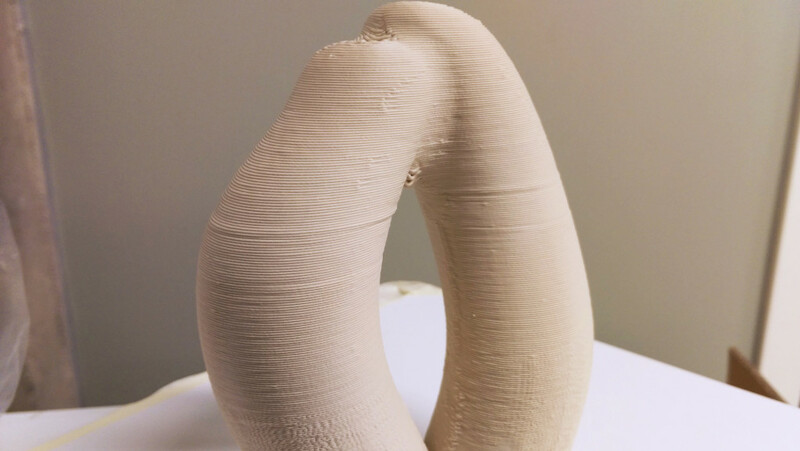 While people have been working with clay to make ceramics and porcelain for thousands of years, we only very recently started feeding it into 3D printers to reproduce our digital shapes. 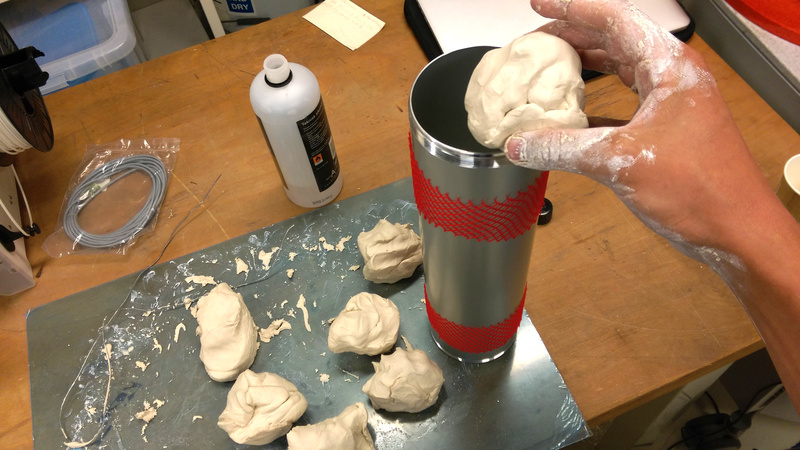 As a part of our on-going research onto design and digital fabrication at AHO, I did some initial experimentation with the clay 3D printer. In this post I’ll explain a bit about getting the printer going and how show some initial results and experiments. Printing with clay is not entirely new – researchers and scientists are directly sintering clay powders together in similar ways to direct sintering of metals (DMLS), while experimental powder/binder combinations, from Tethon3D and others, are making it possible to reproduce complex, reasonably detailed, ceramic artefacts. While all the above-mentioned techniques require costly, industrial machines, there have been several explorations with cheaper, desktop-friendly devices. WASP, an Italian manufacturer of 3D printers, recently released an updated version of its LDM (Liquid Deposition Modeling) extruder kit. It builds onto the WASP 2040 deltabot,which also acts as a standard, plastic-spewing FFF fabrication device. Printing with clay is an immediately appealing idea to anyone who has seen or experienced PLA being extruded and deposited through a desktop 3D printer. Its appealing to watch, not just because the novelty of plastics wears off, but because clay has such a different material quality. It’s stoney, cold, and heavy to the hand. 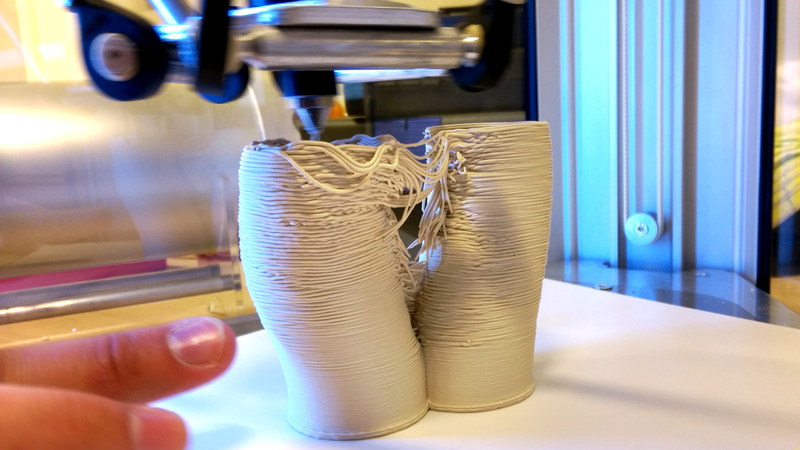 However, it has to be said – fabricating with clay is not as easy as printing with thermal plastics. When printed, the clay artefact is in a so-called ‘green’ state, requiring a secondary process, firing in a kiln, to achieve its durable, and brittle ceramic quality. Not only that, the firing process involves several trips to the kiln. First, the dry (so don’t go directly from 3D printer to kiln) ‘green’ object is bisque fired (950°C, depending on type of clay) where it achieves its semi-vitrified, glasslike form. After that it is usually painted or dipped in glaze and glaze fired, leaving a fine, smooth protective surface on the artefact. Getting the WASP 2040 printer up and running is reasonably quick and easy. 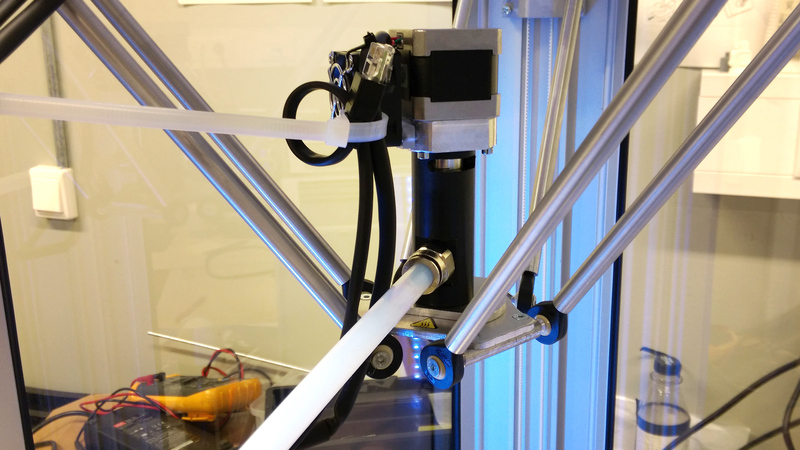 After unpacking and laying out all the parts, and looking at the manuals that come in the SD card, the FDM hotend is simply disconnected and replaced with the LDM extruder mechanism. Apart from a couple of missing nuts and bolts, the whole mechanism comes together nicely. As opposed to the FDM concept, where plastic filament is feeded into a hotend and deposited, the principle here relies on both air pressure and a mechanical screw to extrude the clay mass. Attached to the extruder mechanism via a teflon tube is the aluminium container for the clay material. The pressurised container pushes the clay material through the tube and into the extruder mechanism attached to the deltabot. A stepper then drives a screw inside the extruder which feeds the material through the default 1.2mm replaceable nozzle. The ‘hot end’, or cold end as it actually is, gradually builds up an object in XYZ directions. Clay is a stoney mineral, characterised by its fine-grained, wet, plastic malleability, which turns hard and brittle when dry. As a result, the material cannot be made into a filament, but instead is fed directly trough the pressurised reservoir tank. For the initial trials, the included clay material (which in reality seems more like porcelain) was mixed, as described in this youtube video, with both alcohol and water. There is no definite proportion between clay and liquid, but the ‘official’ video gives a certain impression on the viscosity of the clay. For the experiment I started off with slightly soft clay, later mixing it with more clay to make it harder and more viscous. Be aware, this is the most messy part of the process, as wet clay and slight air pressure can have ‘explosive’ effects! Fortunately the 2040 printer comes with the appropriate configuration files to import into Cura, one of the most popular slicing software available on the market. As the default nozzle diameter is bigger than that of a normal 3D printer, such as an Ultimaker, the layer-heights and shell-thicknesses are larger, making the printer quicker and of slightly lower ‘resolution’ than the standard, 0.4mm nozzle of an Ultimaker. For the inital trials I ran the machine at 50 mm/s, gradually stepping up to around 150mm/s, which resulted in uneven and fuzzy outer perimeters. We gradually settled on 75 mm/s as a good compromise of speed and quality. 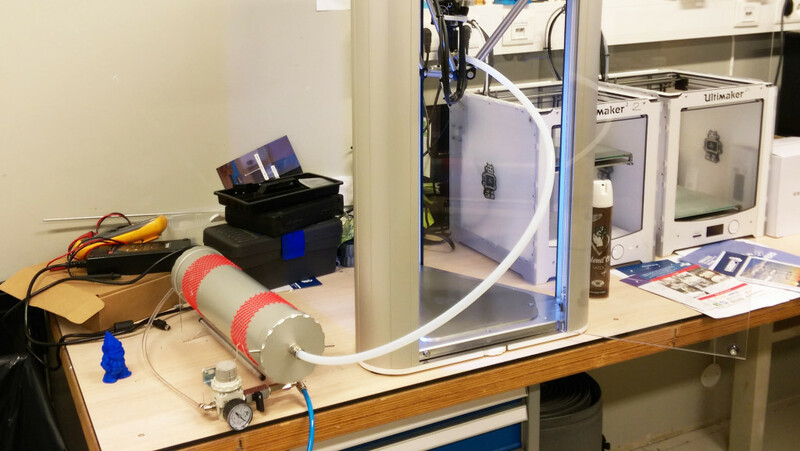 After mounting the extrusion kit and preparing the clay for printing, the aluminium pressurised container was connected to our 8bar pressurised air outlet (Note. If you don’t have access to pressurised air, this fabrication device is not going to work). As I increased the pressure, up to about 4-5 bars, the clay started moving slowly trough the thick teflon tube, into the extruder mechanism. The screw inside the extruder mechanism, barely visible with the replaceable nozzle detached, was turning clockwise, as if the screw screwing onto something. This, it turns out, not the right direction, as the screw is supposed to transfer material, thereby ‘unscrewing’ itself in a counter-clockwise fashion. After some troubleshooting with iMakr, the distributor of the machine, and my friend Alexandre Chappel, we decided to simply switch the direction of the stepper driver cables from the extrusion end. This seemed to solve the problem immediately. The market for novelty filaments is making it possible to work with different materials on a standard FDM printer, such as bamboo-fill, carbonfiber-fill, wood-fill, copper-fill etc. However, their material characteristics are usually the same, since the binder-material that holds them together is a thermoplastic material, usually PLA. Clay printing, however, is fundamentally different, as there is no hot-end, no filament being extruded, and no grinding of materials. All that is required is a soft, clay material. There are potentially endless things to print with this fabrication device. Artists such as Jonathan Keep and Olivier van Herpt are probably two of the most well-known 3D clay printing artists, who have been exploring the potentials of digital clay fabrication since the late 2000’s. Here at AHO we will definately be exploring more with this device, and we hope to show more of our experiments on this blog. For now I’ll share a couple of the first images from the trials we did.